The Evelyn Lauder Lip Set. Featuring a pink clutch and Pure Color Lipstick in Evelyn Wildly Pink. Perfectionist (CP+) Wrinkle Lifting Serum 50ml with Charms. 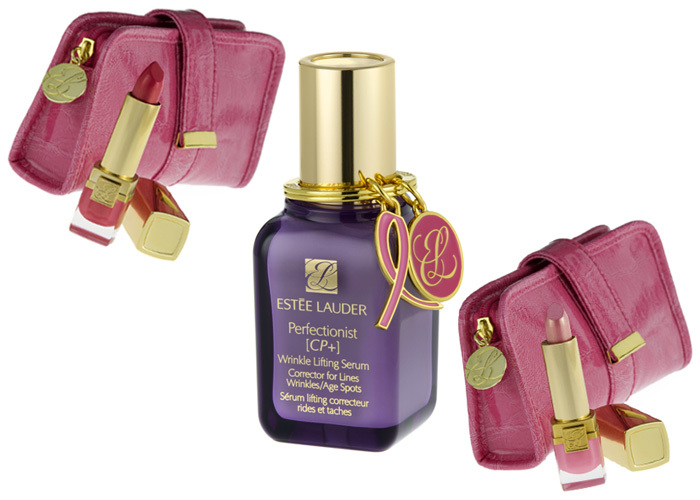 A limited edition Perfectionist serum featuring a reusable keychain with charms inscribed with ‘Estée Lauder Breast Cancer Awareness 2011’. £5.00 from each purchase of The Lip Sets in the UK will be donated to The Breast Cancer Research Foundation. £10.00 from each purchase of Perfectionist (CP+) Wrinkle Lifting Serum 50ml with Charms in the UK will be donated to The Breast Cancer Research Foundation. Available nationwide throughout October, while stocks last.